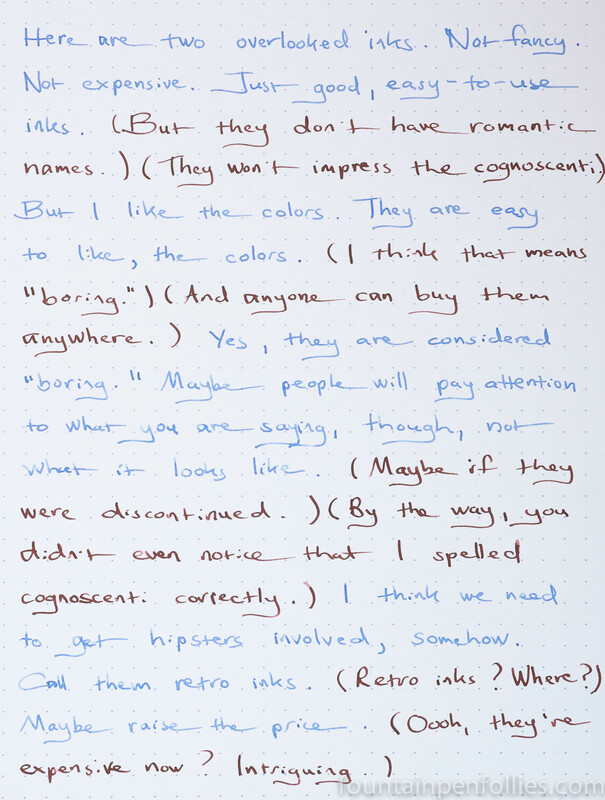 Parker Quink Blue and Waterman Absolute Brown: Overlooked Inks? Lie de Thé is another good one. It is more of a golden or yellow brown, as opposed to the reddish brown of Waterman Absolute Brown. The Waterman is in a vintage Pelikan 400, which is a wet writer, so it looks darker in that pen. Both are lower maintenance inks with good shading, and I would say both are medium to low in saturation. I like the Absolute Brown–I don’t own too many browns, and I’m not sure Ina-ho even counts, but I may have to grab a sample of that Waterman somewhere. I was thinking J. Herbin Lie de the in the alternative, do you have an opinion on that? I like Waterman Absolute Brown, especially when used on sepia on yellowish paper, where I think it gives its best. Paper Quink blue is quite a standard ink, the everyday one, the one that will never disappoint you. Nothing special, if you are looking for fancy colours, but a very reliable ink for office and study (I use it, between others, for note taking).